Bananas are so ubiquitous in New York, it’s hard to imagine a time when you couldn’t fish a few coins from your pocket and buy one at a corner bodega or sidewalk fruit vendor. 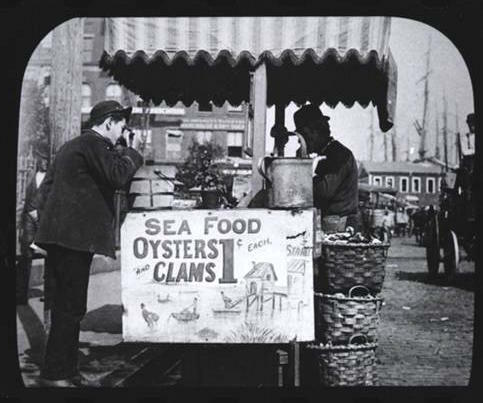 But this exotic food was a luxury item after the Civil War, selling for the equivalent of two bucks. Each banana came peeled and sliced, as the shape of the fruit violated Victorian codes of decency, according to Banana: The Fate of the Fruit That Changed the World. 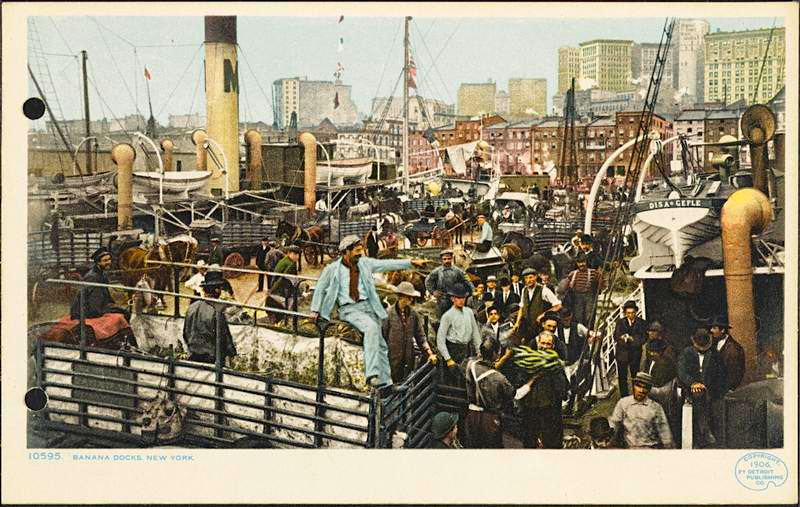 With New York one of the busiest port cities in the world, it wasn’t long before fruit companies began shipping mass quantities of bananas on ships arriving at the “banana docks” at the Old Slip piers near Wall Street. 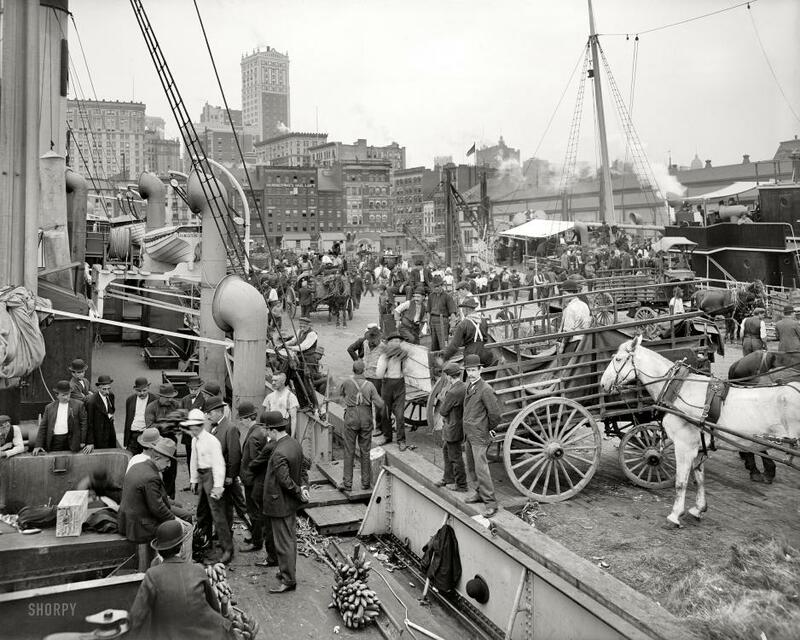 Unloading bananas looked like hard work, according to these turn of the century images. But for small boys in the neighborhood, the banana docks presented opportunities. “In the warm summer days it was great fun sliding under the dock while the men were unloading the boatloads of bananas from Central America,” wrote governor and presidential candidate Alfred E. Smith in his 1929 autobiography. 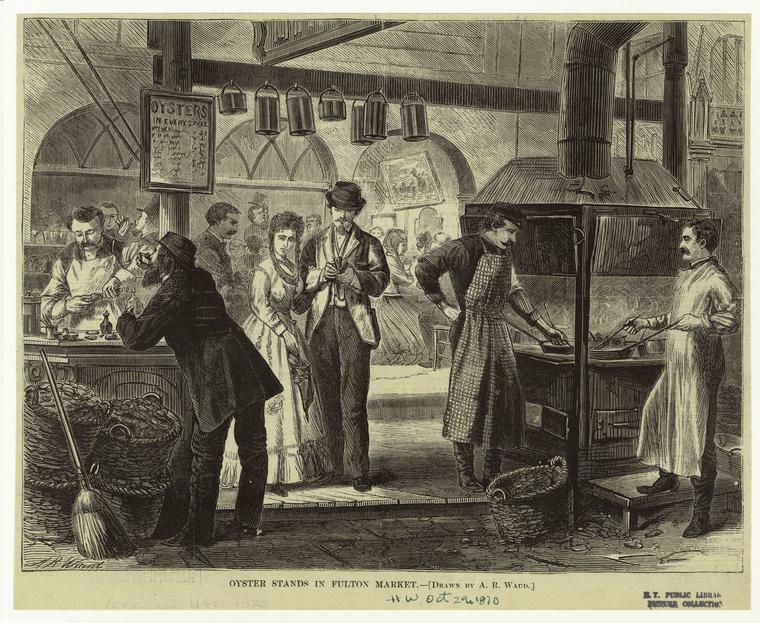 Oysters in the booming 19th century city were kind of like pizza today: sold in exclusive restaurants and lowly dives, prepared in countless styles, and devoured by rich and poor alike. 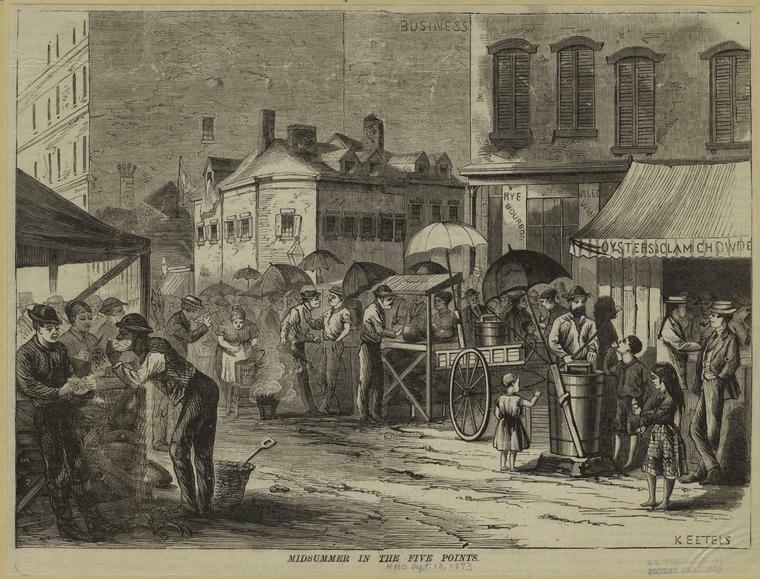 As the ultimate democratizing food, oysters were enjoyed on Fifth Avenue the same as they were in Five Points (see illustration below). 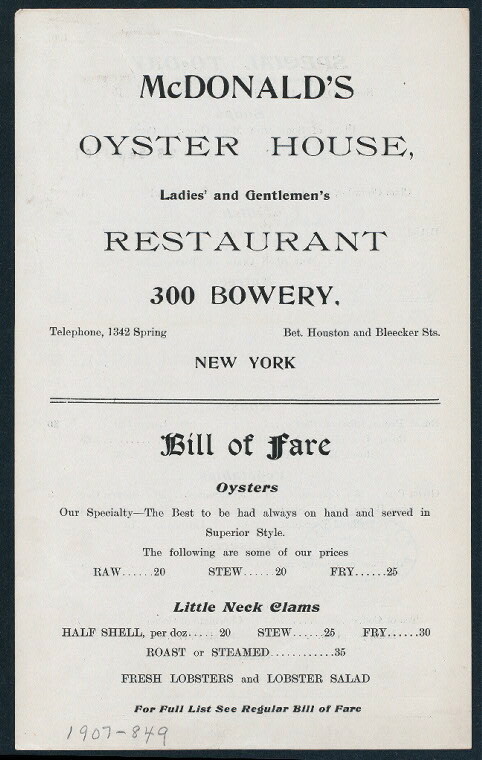 Even Charles Dickens was amazed by their abundance and popularity at cheap Bowery dives during his visit to New York in 1842, which he famously chronicled. “Again across Broadway, and so—passing from the many-coloured crowd and glittering shops—into another long main street, the Bowery. . . .” he wrote in American Notes. The ices offered by this street vendor are probably not artisanal or organic. But I bet they hit the spot on a hot summer day. 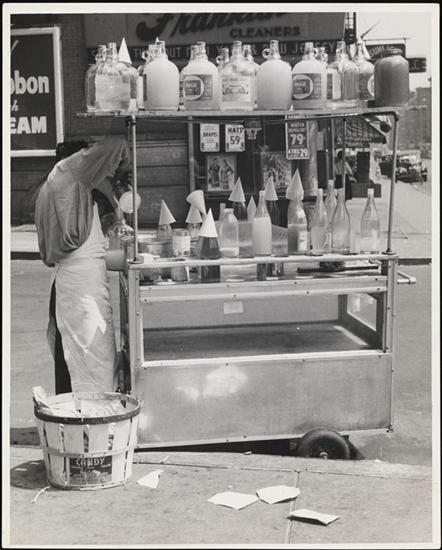 Photographer John Albok captured the cones and syrups of one man’s cart in East Harlem in 1938, a neighborhood of Italians at the time with a small but growing influx of Hispanics. The link from the Museum of the City of New York describes them as piraguas—the Puerto Rican treat sold by many vendors today. 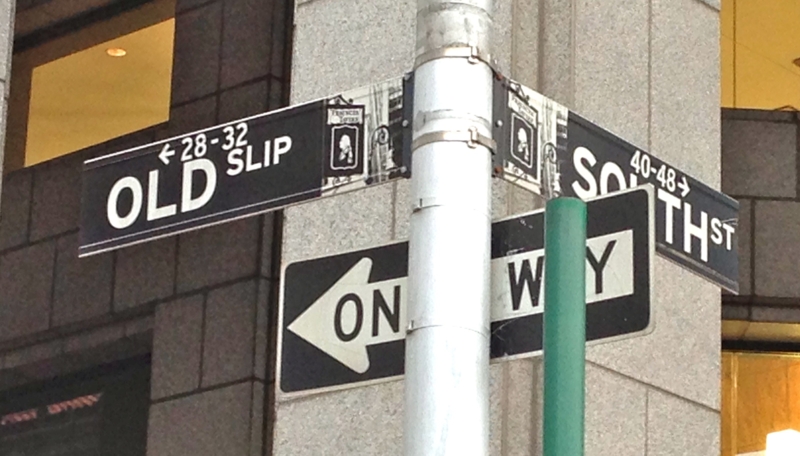 Everyone’s heard of the Garment District and the Financial District. But the Pickle District? 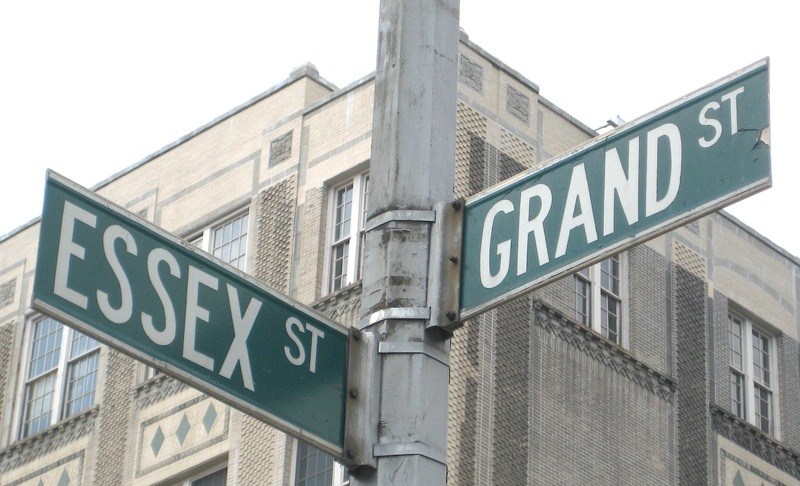 This was the name for the Lower East Side blocks centered on Essex Street, once home to 80 pickle merchants. Some sold the briny street food from shops. Others worked out of pushcarts. 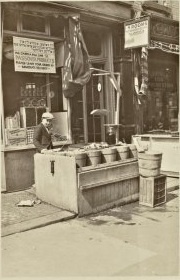 All mostly got their start in the years just before and after the turn of the 20th century, when Jewish immigrants packed the area and began selling a snack already beloved in the city. “By 1659, Dutch farmers in New York grew cucumbers all over the area that is now known as Brooklyn,” states the New York Food Museum. Pickles are still popular, of course, but they’ve long available in supermarkets in jars. Today, only one merchant remains on Essex Street. 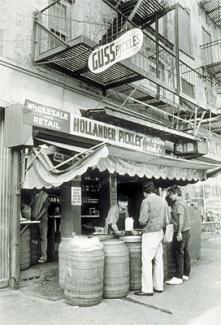 But the pickle gets a yearly shout-out on the Lower East Side during International Pickle Day every October.